If you’re a recent entrant into securities trading, you may not have heard of the pre-demat account era – a time when shares and securities were held ‘physically’ – in the form of certificates and sheets of paper. Imagine that – millions of reams of paper spread across hundreds of thousands of investors holding onto their stocks. A demat account is an electronic account that holds all your securities i.e stocks, shares, bonds etc in an electronic form. In order to open a demat account, you need to go through a depository such as CDSL or NSDL. In the digital age with a demat account, there’s no need for you to hold on to physical share certificates. Courtesy the internet and of course, computers – we’ve migrated to a paperless era – the demat era. Instead of having to deal with obnoxious paperwork, investors now hold their stocks (or mutual funds and Exchange Traded Funds (ETFs)) in a form – in a demat account. 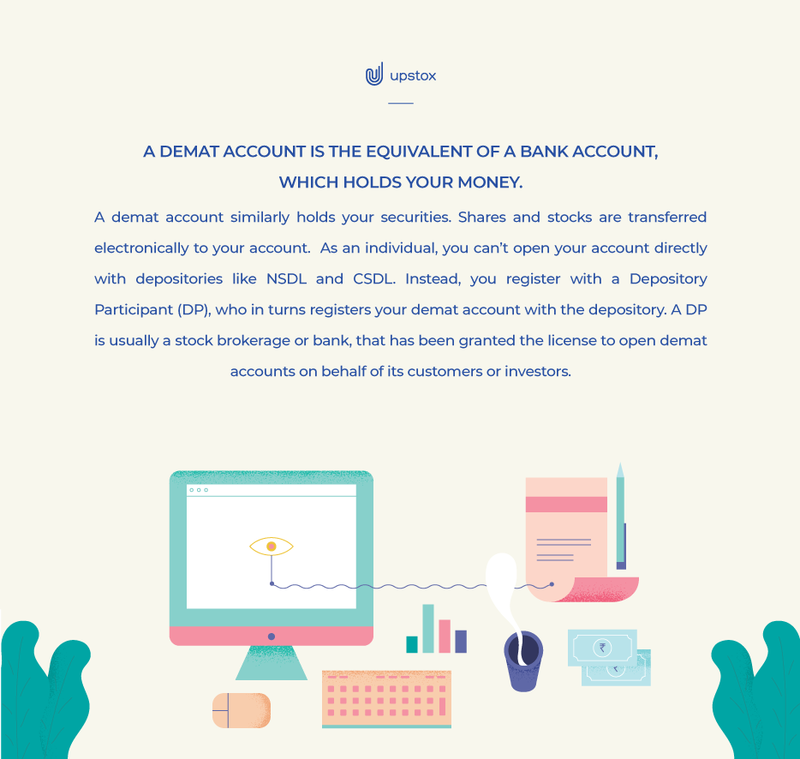 Consider a demat account as the equivalent of a bank account, which holds your money. A demat account similarly holds your securities. Shares and stocks are transferred electronically to your account. India began the transition to the demat system in 1996. The Depository Act was passed in the same year and allowed for the setting up of depositories (like the NSDL and CDSL) that would hold these demat accounts. The NSDL (National Securities Depository Limited) came up in the same year and allowed for India’s first dematerialized accounts on par with global standards. The National Stock Exchange was the first fully automated stock exchange in India. It began operations in 1994, and shortly after, in 1996, share trading in demat forms commenced. Demat holdings is now how the entire country conducts its securities transactions. No stamp duty to be paid on the transfer of shares. Safer than shares which are in paper form due to theft, forgery. Change in clients address recorded with a demat partner gets registered with all companies in which the shareholder has securities thus no need to correspond with each of them separately. Automatic credit into demat account for shares which arises out of bonus and splits. The demat account also reduces the risks for the brokers for delayed settlements. It reduces risks of delayed settlement. Traders can deal with shares from anywhere using this account. You’re no longer losing your stock certificates to events like theft, fire or any other disaster. In the pre-demat era, losing these certificates would cause an extraordinary amount of trouble since you no longer had your primary proof of ownership. Shares are now immediately credited to your account. You don’t have to wait for several days to receive your shares in the mail. They’re cheaper. Printed certificates have costs. A demat holding, therefore, reduces transaction charges, and you avoid stamp duty on them as well. The National Stock Exchange was the first fully automated stock exchange in India. NSE started in 1994. Demat share trading started in 1996. After selecting your DP of choice, you’re expected to fill out an account opening form with the DP. A proof of identity and a proof of address will also be required via submission of photocopies of appropriate documents. Next up is an agreement you’ll need to sign between yourself and your DP. This agreement seeks to clearly state the responsibilities of the DP and the trader (you). You may retain a copy of this agreement. At this stage, you’re more or less done with the demat account opening process. You’ll now receive your demat account number, also referred to as BOID (Beneficial Owner Identification Number). The DP is likely to levy demat account charges towards maintenance, account opening and transaction fees. In an increasingly Internet-dependent world, the traditional process of submitting paper forms is seeing a decline. Now, customers can open demat account online without having to go through all the tedious form filling, simply by agreeing to an eKYC from online brokerages. Upstox verifies your data using your Aadhaar card. It’s all paperless! A demat account is therefore essential for you to ‘hold’ your securities. Unless you’re going to be trading exclusively in futures and options, it’d be wise to open a demat account.